Wow! That’s great news! Sending encouraging thoughts from one survivor to another. My next test is late April. All the best with your results. Good news Dan, I’m pleased for you. I have my next PSA test next month so we’ll see where I’m at. What a game! Thanks, Jim. I hope that you receive good news as well. It is maddening, isn’t it? Thanks. I agree. I view this as a blip on a still-upward trend, but the good thing is that it is a such a slow pace. PSA WTF! Great news Dan. I am glad to hear it. Looking at your graph you had a couple of upward blips early on and now a downward blip (or is it a trend (fingers crossed)?) which possibly goes to suggest that PSA figures are not as precise as we would like. 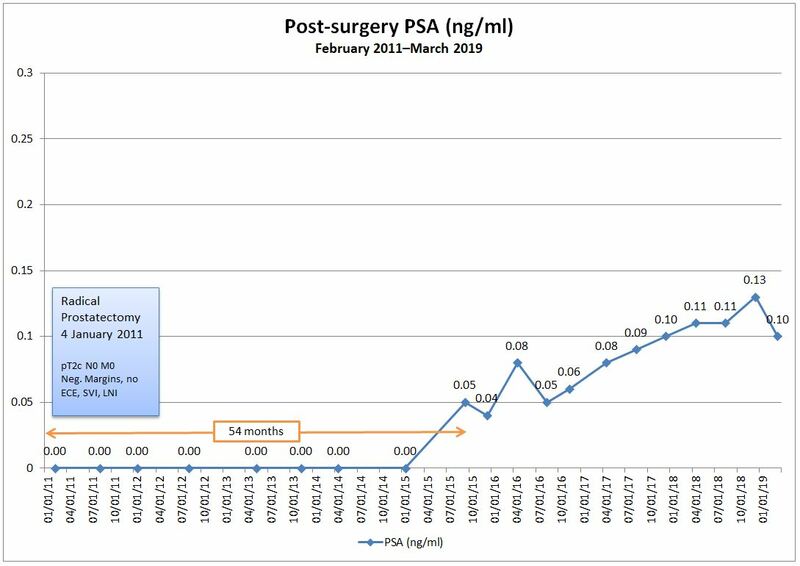 I have a friend who couldn’t understand his high PSA until his consultant told him to stop cycling so much for a few weeks before his next blood draw (and I have delayed my next one following a TURP). Thanks. That’s one thing I’m careful of–no activity for a week before the blood draw that could possibly skew the results. No cycling. No orgasms. Nothing. And, yes, I’ll definitely enjoy the lower value while I can.